The Microsoft Surface hasn't had the easiest of rides in its short lifetime (the first device appeared in 2012) but Microsoft is getting its act together. We're currently updating this article, so check back later for more. Microsoft has revealed a new Surface Pro, the Surface Pro 4 at an event in New York alongside Lumia 950 and 950 XL devices and Microsoft Band 2. 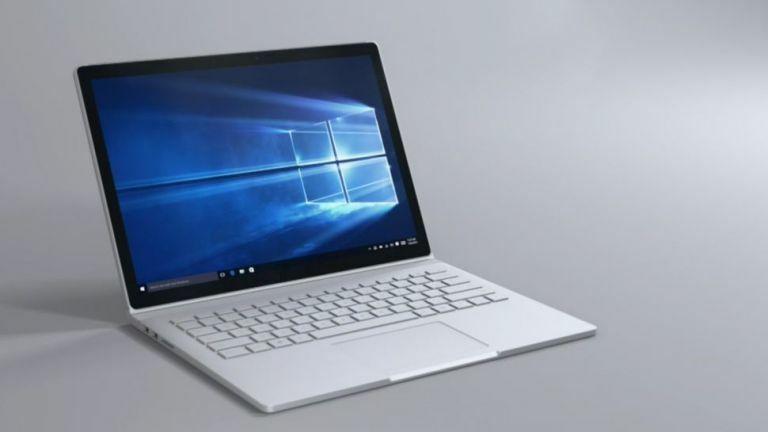 What wasn't expected was a brand new Surface - the Surface Book. It's an extremely powerful laptop that's also the thinnest Windows laptop ever at just 7.7mm thick. It has a 13.5-inch PixelSense screen that's been made as thin as possible with an optical bonded display that chucks out over six million pixels. There's a new type of hinge (which is super cool) called a Dynamic Fulcrum Hinge - check it out in the video below. And yet, it's still a tablet with a detachable keyboard. There's a glass trackpad with Windows 10 gestures plus an unspecified Nvidia GeForce GPU and Intel Skylake Core i5 and i7 processors . Microsoft claims the device is twice as fast as the 13-inch MacBook Air and has 12 hours of battery life. US pricing starts at $1,499 USD aand US pre-orders start from October 7. The device will be available in US stores on October 26. There's no word on UK availability as yet despite Microsoft sending us a UK specific press release. There's a new docking station for corporate use, an even better Type Cover (with improved key travel) and a 12.3-inch display packing around 5 million pixels. Microsoft claims the Surface Pro 4 has the thinnest optical stack on any tablet at 0.4mm thick. And there's a fingerprint reader, too, but it seems to be US-only. We're expecting to hear about UK pricing soon. Of course the hardware is part of Microsoft's vision of a Windows that runs on any device, from tablet to desktop, and the Surface Pro 4 and Surface Book are going to be showcasing the best that Windows 10 has to offer. Microsoft currently has two Surface tablets/laptops on the market, the top-end Surface Pro 3 and the more wallet-friendly Surface 3. Both are in line for an update from Microsoft but it's the premium model that's likely to be first in the queue - the existing Pro is the older of the two and Microsoft will want a flagship product to showcase Windows 10 with. The Surfaces are ostensibly tablets but they're designed to work like laptops too if you clip on the Type Cover keyboard (a rather pricey extra accessory). All this is made possible by software that's (in theory) equally comfortable accepting touchscreen and keyboard input - Windows 8 for the first Surface models and now Windows 10 for the modern devices. Microsoft has said it's working on a continuation of the Surface Pro line, but that's just about all we have to go on as far as official confirmation goes. Considering the Surface Pro 3 was launched way back in June 2014, a refresh is certainly due, and with Windows 10 now out in the wild we don't think Microsoft will wait too much longer. As we've already mentioned, the Surface Pro 3 has been a minor success for Microsoft, so we don't expect the company to deviate too far from the blueprint it's set down. Supply chain sources suggest Microsoft is going to launch both a 12-inch model (like the current one) and a 14-inch variant to better compete against the rumoured iPad Pro. There is some debate about the internals of the upcoming Surface Pro 4: will Microsoft go for power or portability with the CPU? It does look likely that the tablet/laptop hybrid is going to feature Intel's brand new Skylake chipset, which should equate to better graphics performance for users and smooth playback of 4K UHD video as well. We've also seen reports that the storage options will go from 64GB up to 512GB just like the current models, so there's plenty of choice for the discerning customer. Microsoft has said existing Surface Pro 3 accessories (like the Type Cover) are going to be compatible with the next model, which would seem to indicate that the design won't be changing very much. One way that Microsoft could noticeably change the Surface Pro 4's design while keeping the dimensions the same is by slimming down the bezel that surrounds the display. One particularly interesting report reckons Microsoft has taken inspiration from the Dell XPS 13's Infinity Display and slimmed down the Surface Pro 4's display to almost non-existent dimensions. We imagine this would look great, but it raises the question of how you would hold the device when it has no bezel. Apparently Microsoft has introduced a "smart frame" that changes state depending on whether the Surface Pro 4 is being used in portrait or landscape mode. According to the report, it sits at around 13 inches when in laptop mode and shrinks to 12-inches when in tablet orientation. We've already given some of the reasons why we think Microsoft has a new Surface Pro in the pipeline, and the price cuts it's recently been applying to the Surface Pro 3 across the world is another tell-tale sign that something new is imminent. There's a big press event scheduled for October 6 when Microsoft will show off lots of new kit. It makes a lot of sense for Microsoft to want to try and continue the momentum it's picked up with the last couple of Surface devices - it's a bit like the Nexus programme for Google, a way of showing off the software (in this case Windows 10) using the best hardware design. With the future of Windows on mobile still uncertain, Microsoft could use a big win here. At the same time it won't want to interfere too much with its partners around the world (such as Dell and HP) who are making money with their own laptops, tablets and hybrids. Don't expect the Surface line-up to expand dramatically, but it's looking very likely that a Surface Pro 4 and then a more modest Surface 4 are about to be launched on the market. When it comes to details like pricing and international availability we don't really have anything to go on except for the patterns laid down by the previous Surface models. Neither the Surface Pro 3 or the Surface 3 are particularly inexpensive, but at least there's a choice between the two which gives potential buyers some kind of financial flexibility. One area where we might see some movement is in accessories, particularly given Microsoft's recent acquisition of N-trig (the original makers of the Surface Pen). We'd like to see the Type Cover drop in price or maybe even be included in the cost of the Surface but given previous sales strategies that looks unlikely to happen this time around. The main takeaway is: don't buy yourself a Surface Pro 3 right now unless you get a very good deal on one and you don't think you'll need to upgrade it for a while. The Surface Pro 4 should better it in every way, even if it looks almost identical, and as usual you should be able to configure the precise specifications of the Surface through the Microsoft website. Liked this? Check our our guide to the best Microsoft Surface accessories.